Champion caller and call maker Mike "Big Guy" Keller calls ducks from a blind in Minnesota. I once had a turkey guide claim he knew how the birds would act, and he made the same mistake on two successive mornings. More often than not, waterfowl hunters are just as stubborn and have the same tunnel vision. 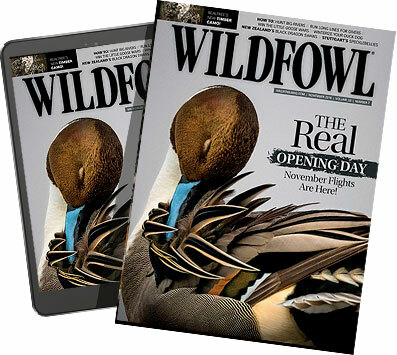 Wild ducks don't react from a textbook, but rather they change from day to day, hour to hour, and even minute-to-minute depending on the weather, hunger and their mood. By adapting our calling to their mood of the moment, being flexible and using every trick, we can be even more successful hunters. To help you become a flexible guru of the call, I've put together some tips that ought to help, or at least help point out a new direction. Ducks have three zones when they come into sight: the entry zone, working zone and exit zone. If you don't get their attention when they come into their entry zone, unless there is something special about your location, you might as well not call. Mississippi call maker Greg Hood says, "When ducks are up in the air they can see not only your decoys and hear your calling, but everything else within their eyesight. Unless you get and hold their attention, they can look down the lake or river and perhaps see something else that interests them more. It may not be any better than where you are, but because you've lost their interest they're going on, and maybe beyond the place they thought was better," he says. So keep a sharp eye out, be observant, and as soon as ducks are sighted, begin calling to them and try to hold their interest until they focus on your decoys. Don't give up calling too soon. "Have you often noticed that the leading ducks in a flock will go on, but the birds in the back will peel off and start working your decoys?" Hood asks rhetorically. "Very often the leading birds will pick up on something farther on, but the trailing ducks will home in on your decoys," Hood says. Unlike geese, ducks are not highly structured, and those who leave a flock are often not coerced back into line as geese are. If the whole flock goes by, there's no sense in blowing your lungs out, but conversely, don't quit too early. Listen to ducks. Become aware of what a hen mallard--the most vocal of the speciesÃ‚ — sounds like as she sits on the marsh or river in the early dawn. She doesn't launch into a 20-note highball, but a four- or five-note contented hen call. When you sight ducks at a distance, it's probably worth pouring it on. They are still far away and may hear only a fraction of your calling. However, once the ducks get close, go for realism, keep the call patterns short, four or five quacks. In other words, sound like that hen. If they start to leave, become urgent, passionate, but still keep it realistic. Keep your notes short. All too often I hear callers who are imitating a laughing Jackass. When ducks call, they call using distinct notes. They may be slightly attached, but in truth, keeping the notes detached sounds far more realistic at a distance, where the ducks are located. Maurice Eason, one of the best callers of ducks I've ever heard, calls in a manner that up close seems contrary to every championship caller any of us have ever heard. Save for his feed call, all the rest have detached notes. Eason calls it "sharp calling," and that's a fair assessment. The point is that by slightly detaching the notes one from the other, the calling sounds like the real thing where the ducks are located. This is not to say that calls should be choppy, but rather that each note of the descending calls should be slightly separated from the preceding note rather than run together, which might appeal to a calling-contest judge, but probably not the ducks. Use confidence calls: the feed chatter and cluck. Great emphasis has always been placed on learning the feeding chuckle or feeding chatter. It's a requirement for a contest caller, but less so for the hunter. In truth, the so-called feed chuckle has nothing to do with feeding ducks. Hearing a flock of birds on the water, all of them chuckling, may sound a bit like this call, but the truth is that only circling mallards and flying mallards make the unique chuckle or chatter. I believe that like geese who double cluck, ducks that chatter when flying are similarly urging their flock mates to land. The chatter is a confidence call, and using it when ducks are closely circling--where they can hear it--can make a difference by making them think that one of their flock is saying, "Hey guys, let's land." The chatter or chuckle is best made using the "D" consonant rather than the "T" sound so often suggested. Using the "duga, duga, duga" sound for the feed chatter with a bit of grunt or growl is more realistic at the duck's distance. Can't do the chatter? Then learn to make the "tuck-a, tuck-a, tuck-a" sound with the emphasis on the "A," or perhaps better to use the "kuk, kuk, kuk" sound that results in a great cluck. Either way, it's nearly equal to the chatter in settling down a wary flock, and easier to learn. On some days it may work far better than the chatter or when mixed with it. With both in your bag of tricks, you're ready. Learn to call with one hand. All too often, one sees callers using both hands over the end of their call, especially when blowing the feed call. Muffled and phony to the core, the feed chatter needs very little modulation from the hands. In general, callers use too much "hand" in their calling. The call should be held firmly, but the opening in the insert should be unobstructed, and the hands used more as a megaphone to direct the sound with very little muffling involved. There is no other way to become a good caller than to practice. Once learned, duck calling is like riding a bicycle, you never forget. However, just as hopping on a bicycle after not riding for 20 years might not be too smooth, so too laying off over the summer develops some rust. The worst of the worst are those who decide that the blind is their practice venue. It's not! Practice at home, out in the back yard, or in your blind before the season starts. It used to be recommended that callers practice in their cars going between work and home, but in today's me-first society where anything but careful driving is the rule, it's best to find a place and practice there where full attention can be directed toward your calling, not divided between calling and driving. One tip that helps when practicing, is to cover one of your ears with the unoccupied hand. This teaches you to call with one hand, and more importantly, it allows you to hear yourself better. For whatever acoustic reason, by covering one ear your calling is clearer and you can really hear what is coming out the end of your call. Champion caller and call maker Mike "Big Guy" Keller says that the best learning tool is to record your calling as you practice, then carefully listen to the playback. Keller quickly adds that most callers who come to him for help with their calling pinch the air too much. "They pinch the air with their lips, and so the sound is thin and not duck-like. Once I get them to open up, the sound opens way up, and really sounds great," Keller says. Keep your call in tip-top shape. Keep it clean, and keep a tight cork in your call. Most calls are Arkansas-style that use a sliver of cork to wedge the reed tightly to the soundboard. From repeated wetting and drying, these corks quickly shrink and don't hold the reed tightly. Maurice Eason says he changes both reed and cork in his Old D-2 O.S. as often as every two days--three at the most. Some reeds are more durable than others, and most of the current crop of Mylar reeds will last a season or two, but the corks will not. Some call makers are now using rubber, neoprene or neoprene-impregnated cork, and these don't seem to shrink as quickly as pure cork. In addition to keeping the reed tight, keep your call clean. Frequently flush it in cool or cold water from the exhaust or inset end near the mouthpiece. Occasionally pull it apart and remove the reed and cork, clean everything thoroughly and reassemble your call being careful not to kink or damage the reed. If you need additional reed and corks, contact the maker. They'll provide them at little or no cost. Go to calling contests and listen to the finalists and copy their sound. Keep in kind though, that contest calling in and of itself does not directly relate to hunting. The contestants are required to perform a set routine of calls, and to deviate is instant oblivion, because to successfully call in the world championship in Stuttgart, Arkansas, competitors must use that series exactly. When hunting ducks, anything goes, and perhaps one of the real downsides of contest calling is that callers get stuck in contest routines and try to make the situation fit them rather than fit their calling to the situation. Perhaps no aspect of waterfowl hunting has enjoyed a greater rise in proficiency than calling, and most of this dramatic rise can be attributed directly to contests, so I'm not denigrating contests, but calling must fit the circumstances, not the circumstances to the calling. 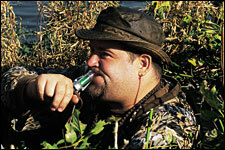 The final point is that everything that becomes duck calling is flexible, and must be used with common sense. Remember, versatility is the key. Callers ought to have a varying repertoire of calls, each with a different sound. Certainly, individuals will sound basically the same on any call they pick up, but there are differences in sound. Acrylic is the most popular call material we have today. It's stable and doesn't change dimensions, and will generally withstand rough handling. But wooden calls have a softer, mellower sound, although legendary call maker Butch Richenback disputes that. When I wanted him to duplicate a great old wooden Chick Major call, he said, "That doesn't matter, I can make a call sound any way you want." And then he proceeded to make me an acrylic call that was a dead ringer for the Major. Still, unless the same area is continually hunted, a variety of calls are necessary. At a minimum, a loud, open-water-style call that projects the sound should be paired with a softer, timber-style call for close-in work or when hunting flooded timber or other close situations. At the least, a spare call should be carried. It doesn't need to be a $300 contest special, but should be a reliable backup should a reed go bad or other calamity befall your primary call. In terms of sound, calls can be very smooth, and all contest calls fall into this group, while hunting calls most often tend to be rougher sounding. On the contest stage, extreme range in both pitch and volume is important to impress the judges with the contestant's ability, but when hunting, rough, quacky sounding calls sound the best and the most natural. With a good repertory of sounds, knowledge of how the birds react to calling and decoys and a full toolbox of calls of different sounds, today's duck hunter has the best chance of working birds close. And that's the real art of duck hunting.